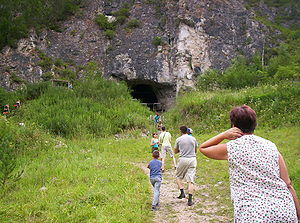 Tourists in front of the Denisova Cave, where Denisovan fossils were found. Denisovans are an extinct hominid group more closely related to the Neanderthals than modern humans and identified from the nuclear and mitochondrial DNA sequences of the roughly 40,000- to 50,000-year-old (or older) fossils found in Siberia. The fossils unearthed from the Denisova Cave in the Altai Mountains of southern Siberia and identified as Denisovan are quite limited in number: a pinkie bone (distal manual phalanx) and two teeth (molars) from three different Denisovan individuals, as of 2013. However, the entire genome has been sequenced and this DNA sequence shows the Denisovans to be a distinct group that shares a common ancestor with Neanderthals. It is believed they were more prevalent in East Asia while Neanderthals dominated Europe and western Asia. However, DNA extracted from a 300,000 to 400,000-year-old femur found in a cave in Spain also surprisingly yielded Denisovan DNA. The issue of whether the Denisovans are a unique species or a subspecies of Homo sapiens (Homo sapiens ssp. 'Denisova) has not been settled, just as it has not been settled for the Neanderthals, which are variously designated as Homo sapiens neanderthalensis and Homo neanderthalensis. The use of mitochondrial DNA (mtDNA) and nuclear DNA analysis has proved valuable in elucidating the evolutionary relationships among species. While for many fossils of ancient hominins the DNA cannot be recovered, in the case of the Denisova finds, both mitochondrial and nuclear DNA has been recovered and the preservation was exceptional in the case of the Denisova phalanx. With Neanderthal DNA sequences also known, as well as modern humans, much has been gleamed about the evolutionary relationships among these three groups, and humanity has gained significant insight into its origins and history. The earliest delineated member of the genus Homo is H. habilis, which lived from 2.33 to 1.44 million years ago, although some authorities do not consider it should be included in Homo, considering it more worthy, for example, to be retained in Australopithecus (Wood and Richmond 2000). There also are proposals for a new discovery, Homo gautengensis, to be considered the world's earliest recognized species of human, predating H. habilis (Viegas 2010). Homo erectus is considered to have arrived around 1.8 million years ago, with fossils supporting its existence to 143,000 years ago. Homo ergaster is another early Homo species that has been delineated, and traced to about 1.8 to 1.3 million years ago. H. ergaster is possibly ancestral to or shares a common ancestor with H. erectus, or is the African variety of H. erectus; it is widely considered to be the direct ancestor of later hominids such as Homo heidelbergensis, Homo sapiens, Neanderthals, Denisovans, and even Asian Homo erectus. Homo erectus and H. ergaster were the first of the hominina known to leave Africa. For example, H. erectus is known to have spread as far as Georgia, India, Sri Lanka, China and Java. There is also support for the idea that that the numerous distinct species being recognized in the fossil record, such as H. erectus and H. habilis, are actually just morphological variation among members of a single evolving lineage among early members of the Homo genus, and that perhaps even only one species with a lot of variability emerged from Africa (Wilford 2013; Watson 2013; Lordkipanidze et al. 2013). Modern human beings, Neanderthals, and Denisovans are believed to have shared a common ancestor about 400,000 to 500,000 years ago (Marshall 2013; Green et al. 2010). One theory is that these three groups all descended from Homo heidelbergenesis, which lived between 600,000 to 250,000 years ago (Marshall 2013) (other species suggested as ancestral are H. rhodesiensis and H. antecessor). One branch of H. heidelbergenesis are theorized to have left Africa about 400,000 years ago and split shortly thereafter to become Neanderthals, which settled in West Asia and Europe, and Denisovans, which settled farther to the east (NG 2013). Neanderthals are considered to have lived from perhaps 400,000 years ago, with their appearance in the European fossil record variously put at 200,000 (Zimmer 2013) to 400,000 years ago (Green et al. 2010). Neanderthals disappeared from the fossil record about 30,000 years ago. Based on the DNA sequences for the nuclear genome of Neanderthals and modern humans, the population split between Neanderthals and modern humans took place 270,000 to 440,000 years ago (Reich et al. 2010). Archaic Homo sapiens, the forerunner of anatomically modern humans, appeared between 400,000 and 250,000 years ago (O'Neil 2013). Anatomically modern humans are believed to have evolved from archaic Homo sapiens in the Middle Paleolithic, about 200,000 to 130,000 years ago (SA 2005; NG 2013), then migrated out of Africa some 50,000 to 100,000 years ago (Recent African Ancestory Theory) and replaced local populations of H. erectus, H. floresiensis, H. heidelbergenesis, and the Denisovan and Neanderthal populations. The transition to behavioral modernity for Homo sapiens with the development of symbolic culture, language, and specialized lithic technology happened around 50,000 years ago according to many anthropologists (Mellars 2006), although some suggest a gradual change in behavior over a longer time span (Mcbrearty and Brooks 2000). Until about 50,000 to 40,000 years ago, the use of stone tools seems to have progressed stepwise: Each phase (habilis, ergaster, and neanderthal) started at a higher level than the previous one, but once that phase had started, further development was slow. After 50,000 years ago, in what Jared Diamond, author of The Third Chimpanzee, and other anthropologists characterize as a "Great Leap Forward," human culture apparently started to change at much greater speed: "Modern" humans started to bury their dead carefully, made clothing out of hides, developed sophisticated hunting techniques (such as pitfall traps, or driving animals to fall off cliffs), and made cave paintings. This speed-up of cultural change seems connected with the arrival of modern humans, Homo sapiens sapiens. Additionally, human culture began to become more technologically advanced, in that different populations of humans begin to create novelty in existing technologies. Artifacts such as fish hooks, buttons, and bone needles begin to show signs of variation among different population of humans, something what had not been seen in human cultures prior to 50,000 BP. The Denisovans are not well delineated anatomically, given the very limited fossils found. The first fossils were discovered in 2008, when a small bone fragment of a finger was found. Two teeth were subsequently found. The lack of fossils has made anatomical representations of the group difficult. However, the DNA was preserved and was able to be extracted and has yielded excellent genetic analysis. As noted in a 2013 article in the Dartmouth Undergraduate Journal of Science, "Although Denisovans are thus far only represented by one finger bone and two teeth, they are currently the most well-known archaic human genetically – including Neanderthals of which there are hundreds of fossil records" (DUJS 2013). As a result, it was found that the Denisovans appear to be a unique group that shares a common origin with Neanderthals. DNA analysis further revealed that the Denisovans lived among and interbred with the ancestors of some present-day modern humans, with up to 6% of the DNA of Melanesians and Australian Aborigines deriving from Denisovans (Zimmer 2010; Callaway 2011). In 2013, mitochondrial DNA was extracted from a 300,000- to 400,000-year-old sliver of hominin femur bone from Spain, which had been seen as either Neanderthal or Homo heidelbergensis. An almost complete mitochondrial genome was retrieved, the oldest human DNA sequenced. The DNA surprising yielded ancestral Denisonian DNA (Callaway 2013; Gibbons 2013). Little is known of the precise anatomical features of the Denisovans since the only physical remains discovered thus far are the finger bone and two teeth from which genetic material has been gathered. The single finger bone is unusually broad and robust, well outside the variation seen in modern people. Surprisingly, it belonged to a female, indicating the Denisovans were extremely robust, perhaps similar in build to the Neanderthals. The tooth that has been characterized shares no derived morphological features with Neanderthal or modern humans (Reich et al. 2010). DNA analysis suggested the finger bone came from a young girl with brown hair, brown eyes, and dark skin, based on the alleles found and their expression in modern humans (Meyer et al. 2012). In 2008, Russian archaeologists from the Institute of Archaeology and Ethnology of Novosibirsk, working at the site of Denisova Cave (51°40′ N; 84°68′ E) in the Altai Mountains of Siberia, uncovered a small bone fragment from the fifth finger of a juvenile hominin (the distal manual phalanx of the fifth digit). Episodic hominin occupation of at least 125,000 years has been documented at this site and the phalanx was found in a stratum (layer 11) dated to 48,000 to 30,000 years ago (Krause et al. 2010). Artifacts, including a bracelet, excavated in the cave at the same level were carbon dated to around 40,000 BP. The juvenile, a female, is believed to have been between five and seven years old when she died. Krause et al. (2010) noted that stratigraphy and indirect dates suggest the individual lived between 30,000 and 50,000 years ago. Krause et al. (2010) also noted that individuals with Neanderthal mtDNA was found less than 100 kilometers from Denisova Cave, as well as suggestions of the presence of Upper Palaeolithic anatomically modern humans. It was assumed that the phalanx belonged to Neanderthals living in the area during that time period. However, Krause et al. reported in 2010 that the mitochondrial DNA, when sequenced, diverged from both Neanderthals and modern humans. The finding was dubbed the "X woman" (referring to the maternal descent of mitochondrial DNA) or the Denisova hominin. In December 2010 another paper was published with details of the nuclear genome of the finger bone (Reich et al. 2010). It was found that the population indeed was distinct from the Neanderthals but shared a common origin with Neanderthals and was more closely related to Neanderthals than to modern humans. It remains unclear what species the genome belongs to, but Reich et al. designated the hominin population "Denisovans." In 2000, a tooth also had been found in layer 11, in the south gallery of the Denisova Cave. This was determined to be from a young adult and thus a different individual than the finger bone, which came from a juvenile. This tooth is considered to be an almost complete left third or second upper molar. Reich et al. (2010) describes the molar: "the crown is trapezoidal and tapers strongly distally, with bulging lingual and buccal walls giving the tooth an inflated appearance... The roots are short but robust and strongly flaring. Overall, the tooth is very large (meiodistal diameter 13.1mm; buccolingual, 14.7mm)." Reich et al. notes that the tooth is very large and as a third molar would be outside the normal size variation of all fossil Homo taxa except H. habilis and H. rudolfensis, and as a second molar, it would be larger than Neanderthals or early modern humans, but similar to that of H. erectus and H. habilis. It is also distinguished from most Neanderthal third molars by the absence of hypocone reduction (Reich et al. 2010). Reich et al. (2010) conducted mitochondrial DNA analysis of an extract from the dentin form the root of the tooth. This led to their conclusion that the tooth and phalanx derive from two different individuals (separated about 7,500 years in time) likely from the same hominin population and that the Denisovan population is distinct from Neanderthals and modern humans. An additional molar also was found in the summer of 2010 and attributed as well to the Denisovan population (Gibbons 2011). In 2011, a toe bone was discovered in layer 11 of the cave, and hence was contemporary with the finger bone and upper molar. Preliminary characterization of the bone's mitochondrial DNA suggests it belonged to a Neanderthal, not a Denisovan (Gibbons 2011). In 2012, Meyer et al. reported a higher quality analysis of the genome sequence of the finger bone. In 2013, mitochondrial DNA from a 400,000 year old hominin femur bone from Spain, which had been seen as either Neanderthal or Homo heidelbergensis, was found to be closer to Denisovan mtDNA than to Neanderthal mtDNA (Callaway 2013). Some older finds may or may not belong to the Denisovan line. Determining the DNA sequence of mitochondrial DNA (mtDNA) and nuclear DNA in organisms provides a useful tool to elucidate the evolutionary relationships among species. In general, closely related organisms have a high degree of agreement in the molecular structure of these substances, while the molecules of organisms distantly related usually show a pattern of dissimilarity. Mitochondrial DNA in hominids is inherited from the mother (maternally inherited) and there is usually no change in mtDNA from parent to offspring, although it does recombine with copies of itself within the same mitochondrion and there is a mutation rate, which is generally higher than that of nuclear DNA. The mtDNA is useful for tracking ancestry through females (matrilineage). Nuclear DNA is inherited from both parents and genes are rearranged in the process of recombination. Conserved sequences, such as mitochondrial DNA, are expected to accumulate mutations over time, and assuming a constant rate of mutation provides a molecular clock for dating divergence The DNA sequence of mtDNA and nuclear DNA has been determined from a large number of species (including some organisms that are extinct), and the comparison of those DNA sequences represents a mainstay of phylogenetics. However, for most fossils of ancient hominin species, the DNA cannot be recovered, because it degrades over the long time periods, and this degradation increases with temperature and such conditions as acidic soil. Most early hominin fossils are from tropical and equatorial regions where conditions for survival are poor. Thus, DNA sequences to date have not been recovered from Homo erectus, H. heidelbergensis, or H. antecessor (Krause et al. 2010). However, both mitochondrial and nuclear DNA has been recovered from the Denisova fossils, possibly thanks to the cool climate conditions in the high altitude environment of the Altai Mountains. The average annual temperature of the cave remains at 0°C, which has contributed to the preservation of archaic DNA among the remains discovered (Mitchell 2012). Reich et al. (2010) note that "the Denisova phalanx is one of the few bones found in temperate conditions that are as well preserved as many permafrost remains," further noting that "the molecular preservation of the Denisova phalanx is exceptional in that the fraction of endogenous relative to microbial DNA is about 70%, whereas all Neanderthal remains to date have been below 5% and typically lower than 1%. Reich et al. (2010) further note that these conditions are not apparently due to something that effects all remains in Denisova Cave because the tooth they examined has the fraction at just 0.17%. With DNA sequences known for modern humans and for many Neanderthals, DNA analysis of the Denisova remains has allowed study of the evolutionary relationships among these groups. The first DNA study of Denisovans was reported by Krause et al. in Nature in 2010 (received January, published March), in which this group presented the complete mitochondrial DNA genome from the phalanx found in the layer 11 stratum and now placed in this group. This DNA study was the work of a team of scientists led by Johannes Krause and Swedish biologist Svante Pääbo from the Max Planck Institute for Evolutionary Anthropology in Leipzig, Germany. The study compared the Denisovan's mtDNA sequence to 54 present-day modern human mtDNAs, six complete Neanderthal mtDNAs, a Late Pleistocene mtDNA recently determined from an early modern human from Kostenki, Russia, one bonobo (Pan paniscus) mtDNA, and one chimpanzee (Pan troglodytes) mtDNA. It was found that the Denisova individual differed by an average of 385 positions from modern humans, compared to the average of 202 between Neanderthals and modern humans and 1,462 positions with the chimpanzee. The study not only indicated that this finger bone belonged to a member of a group that was neither Neanderthal nor modern human, but was an unknown archaic human, and also suggested that modern humans, Neanderthals, and the Denisovan individual last shared a common ancestor around one million years ago (Krause et al. 2010). The mtDNA analysis further suggested this new hominin species was the result of an early migration out of Africa, distinct from the out-of-Africa migrations associated with Neanderthals and modern humans, but also distinct from the earlier African exodus of Homo erectus (Katsnelson 2010). In a subsequent 2010 publication in Nature (received August, published December), Reich et al. presented their findings on the nuclear genome from DNA extracted from the Denisovan's finger bone and the mtDNA genome from DNA extracted from the tooth found in 2000. In this second study, DNA was extracted from the entire internal portion of the phalanx sample and sequenced. The researchers were able to achieve near-complete genomic sequencing, allowing a detailed comparison with Neanderthal and modern humans. A total of 82,227,320 sequences were mapped uniquely to the human genome and 72,304,848 sequences were mapped uniquely to the chimpanzee genome. One finding is that whereas the earlier mtDNAs showed a divergence of the Denisova mtDNA to present-day African human mtDNAs to be about twice as deep as that of Neanderthal mtDNA, the average divergence of the nuclear genome of the Denisova sample was similar to the divergence found for Neanderthals. This similar divergence suggested that both Neanderthals and Denisovans descended from a common ancestral population and one that separated earlier from the ancestors of present-day humans. The estimated average time of divergence between Denisovan and Neanderthal sequences is 640,000 years ago, and the time between both of these and the sequences of modern Africans is 804,000 years ago. They suggest the divergence of the Denisova mtDNA results either from the persistence of a lineage purged from the other branches of humanity through genetic drift or else an introgression from an older hominin lineage (Reich et al. 2010). In addition to the suggestion that the Denisovans shared a common origin with the Neanderthals, additional findings from this nuclear genome study suggested the Denisovans ranged from Siberia to Southeast Asia, and that they lived among and interbred with the ancestors of some present-day modern humans, with an estimated 4.8 +/- 0.5% of the genomes of Melanesians deriving from Denisovans (Reich et al. 2010; Zimmer 2010; Callaway 2011). DNA was extracted from the dentin from the root of the tooth and the complete mtDNA genome was assembled at an average coverage of 58-fold. It was found that the sequence of the tooth differed at two positions from the mtDNA of the phalanx and differed at about 380 positions from both present-day humans and Neanderthals. It was estimated that the time since the most recent common ancestor between the two mtDNAs (tooth and finger bone) was about 7,500 years, with a 95% upper bound of 16,000 years. Thus, it was concluded that the tooth and phalanx derived from two different individuals. However, the mtDNAs were highly similar and thus suggestive that the two individuals belonged to the same population. Reich et al. further noted that the morphology of the Denisova molar supported the DNA evidence that the Denisova population was a distinct population from modern humans and from Neanderthals (Reich et al. 2010). The overall conclusion of the Reich et al. (2010) study was that the Denisova population shared a common ancestor with Neanderthals and has a distinct population history. According to Reich et al. (2010), "We define this group based on genomic evidence and call it Denisovans, but refrain from any formal Linnaean taxonomic designations that would indicate species or subspecies status for either Neanderthals or Denisovans. In our view, these results show that on the Eurasian mainland there existed at least two forms of archaic hominins in the Upper Pleistocene: a western Eurasian form with morphological features that are commonly used to define them as Neanderthals, and an eastern form to which the Denisova individuals belong." Neither the phalanx nor the tooth were large enough to allow direct radiocarbon dating, but seven other bone fragments found in layer 11 were dated and four of these were found to have dates older than 50,000 years before present (BP) and three between 16,000 and 30,000 BP. It was felt likely that the molar and phalanx were part of the older occupation. Reich et al. (2010) concludes that "the picture that emerges" is that the "Denisova population is a sister group to Neanderthals" and that "after they diverged from one another, Denisovans and Neanderthals had largely separate population histories" and that "Denisovans but not Neanderthals contributed genes to ancestors of present-day Melanesians." In 2012 in Science, Meyer et al., also of the Svante Pääbo group as with the previous studies, reported a new DNA library preparation method (a single-stranded library preparation method versus the normal double-stranded preparation) that allowed the delineation of a higher-quality version of the Denisova genome. This higher coverage genome (30x versus the 1.9-fold genomic coverage of the Reich et al. study on the phalanx), indicated that the genetic diversity of this group was low (but see Penninsi report below) and that allowed tentative dating of of the specimens. This later dating suggested the finger bone to be dated to between 74,000 and 82,000 years before present, although there are multiple sources of error possible. The population divergence between Denisovans and present-day humans was estimated to be between 170,000 and 700,000 years, with another estimate of 800,000 years as the time of the divergence. Meyer et al. further clarified that Denisovans and Neanderthals shared a karyotype consisting of 46 chromosomes (23 pairs; great apes have 24 pairs) (Meyer et al. 2012). Penninsi (2013) reported that from the second tooth, an mtDNA sequence was recovered that showed an unexpectedly large number of genetic differences compared to that found in the other tooth and the finger, suggesting a high degree of mtDNA diversity. These two individuals from the same cave showed more diversity than seen among sampled Neanderthals from all of Eurasia, and were as different as humans from different continents. A study of the mitochondrial DNA from a 300,000- to 400,000-year-old portion of bone found in Spain's Atapuerca Mountains showed this proto-Neanderthal had ancestral Denisova DNA (Gibbons 2013). A detailed comparison of the Denisovan, Neanderthal, and human genomes has revealed evidence for significant interbreeding among the lineages. Through such interbreeding, 17% of the Denisova genome represents DNA from the local Neanderthal population, while evidence also was found of a contribution to the nuclear genome of the Denisovans from an ancient hominin lineage yet to be identified (Pennisi 2013; Marshall 2013). Approximately 4% of the DNA of non-African modern humans is shared with Neanderthals (Reich et al. 2010), suggesting interbreeding. In addition, tests comparing the Denisova genome with those of six modern humans—a ǃKung from South Africa, a Nigerian, a Frenchman, a Papua New Guinean, a Bougainville Islander ,and a Han Chinese—showed that between 4% and 6% of the genome of Melanesians (represented by the Papua New Guinean and Bougainville Islander) derives from a Denisovan population. This DNA was possibly introduced during the early migration to Melanesia. These findings are in concordance with the results of other comparison tests that show a relative increase in allele sharing between the Denisovan and the Aboriginal Australian genome, compared to other Eurasians and African populations; however it has been observed that Papuans, the population of Papua New Guinea, have more allele sharing than Aboriginal Australians (Rasmussen et al. 2011). While genetic evidence has been found that Denisovan ancestry is shared by Melanesians, Australian Aborigines, and smaller scattered groups of people in Southeast Asia, such as the Mamanwa, a Negrito people in the Philippines, not all Negritos were found to possess Denisovan genes. Onge Andaman Islanders, and Malaysian Jehai, for example, were found to have no significant Denisovan inheritance. These data place the interbreeding event in mainland Southeast Asia, and suggest that Denisovans once ranged widely over eastern Asia (Callaway 2011; Reich et al. 2011). The genome of Denisovans shows snippets that seem to be from another group, either a previously undiscovered species or one of the many fossil species that have been identified but not genetically analyzed, such as Homo erectus, H. heidelbergenesis. Callaway, E. 2011. First Aboriginal genome sequenced. Nature News September 22, 2011. Callaway, E. 2013. Hominin DNA baffles experts. Nature 504: 16-17. Retrieved December 19, 2013. Dartmouth Undergraduate Journal of Science (DUJS). 2013. High-quality archaic human genome sequencing. Dartmouth Undergraduate Journal of Science March 10, 2013. Retrieved December 18, 2013. Gibbons, A. 2011. Who were the Denisovans? Science 333: 1084-1087. Retrieved December 19, 2013. Gibbons, A. 2013. Elusive Denisovans sighted in oldest human DNA. Science 342(6163): 1156. Green, R. E., J. Krause, A. W. Briggs, et al. 2010. A draft sequence of the Neandertal genome. Science 328(5979): 710–22. PMID 20448178. Retrieved December 17, 2013. Katsnelson, A. 2010. New hominin found via mtDNA. The Scientist March 24, 2010. Retrieved December 19, 2013. Krause, J., Q. Fu, J. M. Good, et al. 2010. The complete mitochondrial DNA genome of an unknown hominin from southern Siberia. Nature 464: 894-897. Retrieved December 17, 2013. Lordkipanidze, D., M. S. Ponce de León, A. Margvelashvili, et al. 2013. A complete skull from Dmanisi, Georgia, and the evolutionary biology of early Homo. Science 342(6156): 326-331. Retrieved October 16, 2013. Marshall, M. 2013. Mystery human species emerges from Denisovan genome. New Scientist November 19, 2013. Retrieved December 16, 2013. Mcbrearty, S., and A. S. Brooks. 2000. The revolution that wasn't: A new interpretation of the origin of modern human behavior. "Journal of Human Evolution" 39(5): 453–563. PMID 11102266. Meyer, M., M. Kircher, M. T. Gansauge, et al. 2012. A high-coverage genome sequence from an archaic Denisovan individual. Science 338(6104): 222-226. Retrieved October 19, 2013. Mellars, P. 2006. Why did modern human populations disperse from Africa ca. 60,000 years ago?. "Proceedings of the National Academy of Sciences" 103 (25): 9381–6. PMID 16772383. Retrieved October 19,2013. Mitchell, A. 2012. DNA turning human story into a tell-all. New York Times January 31, 2012. Retrieved December 19, 2013. National Geographic (NG). 2013. Why am I denisovan. The Genographic Project. Retrieved October 16, 2013. O'Neil, D. 2013. Evolution's past is modern human's present. "Behavioral Sciences Department", Palomar College, San Marcos, California. Retrieved December 19, 2013. Pennisi, E. 2013. More genomes from Denisova Cave show mixing of early human groups. "Science" 340: 799. Retrieved December 19, 2013. Rasmussen, M.,X. Guo, Y.Wang, et al. 2011. An Aboriginal Australian genome reveals separate human dispersals into Asia. Science 334(6052): 94-98. Retrieved December 19, 2013. Reich, D., R. E. Green, M. Kircher, J. Krause, et al. 2010. Genetic history of an archaic hominin group from Denisova Cave in Siberia. "Nature" 468(7327): 1053–1060. PMID 21179161. Retrieved February 9, 2014. Reich, D., N. Patterson, M. Kircher, et. al. 2011. Denisova admixture and the first modern human dispersals into Southeast Asia and Oceania. The American Journal of Human Genetics 89: 516-28. PMID 21944045. Retrieved December 19, 2013. Scientific American (SA). 2005. Fossil reanalysis pushes back origin of Homo sapiens. "Scientific American " February 17, 2005. Retrieved December 19, 2013. Watson, T. 2013. Skull discovery sheds light on human species. USA Today October 17, 2013. Retrieved December 16, 2013. Wilford, J. N. 2013. Skull fossil suggests simpler human lineage.] New York Times October 17, 2013. Retrieved December 16, 2013. Wood, B. and B. G. Richmond. 2000. Human evolution: Taxonomy and paleobiology. Journal of Anatomy 197 (Pt 1): 19–60. PMID 10999270. Retrieved December 19, 2013.
Zimmer, C. 2010. Denisovans were Neanderthals' cousins, DNA analysis reveals. New York Times December 22, 2010.
Zimmer, C. 2013. Toe fossil provides complete Neanderthal genome. New York Times December 18, 2013. The Denisova Consortium's raw sequence data and alignments. This page was last modified on 5 November 2018, at 20:34.